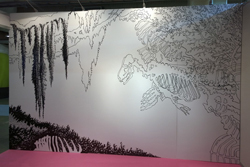 MENTAL DÉSORDRE, the exhibition about mental health with dozens of Vappu Rossi's amazing murals on wall structures, opened in in the beginning of April at Cité des sciences et de l'industrie, Universcience, Paris! The exhibition will be open until 6th of November 2016! Porvoo old town, Mannerheim Bridge. 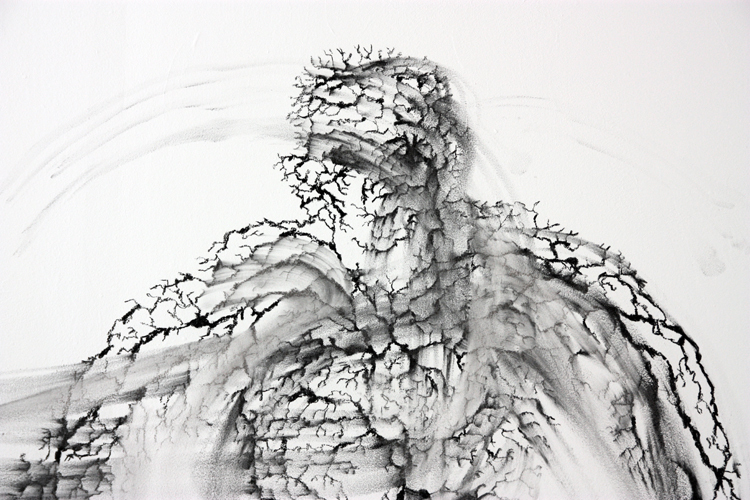 Charcoal on wall, scale 10:1. Porvoo Pre-Triennial 2016. Porvoo old town, Mannerheim Bridge. Charcoal on wall, scale 10:2. Porvoo Pre-Triennial 2016. 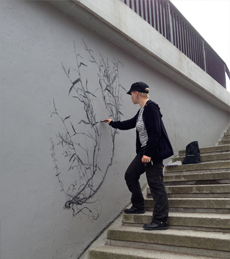 Performative wall drawing at Municipal Fair, Helsinki 10.–11.9.2014. Suomen Taiteilijaseura ry, Teollisuustaiteen Liitto Ornamo, Arkkitehtuurin tiedotuskeskus Archinfo Finland, Ympäristötaiteen säätiö, Taiteen edistämiskeskus. 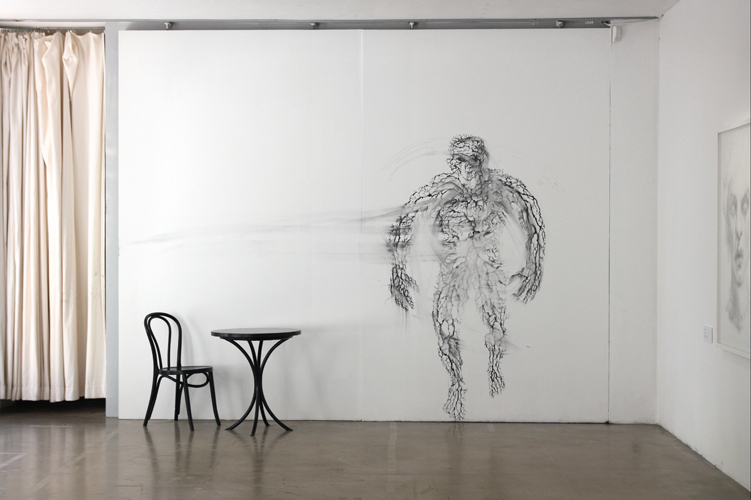 The charcoal wall drawing referring to the video artwork Carbon Based Love, 2014. 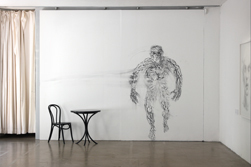 The wall drawing, the table and the chair referring to the video artwork, 2014. The beginning of the opening. 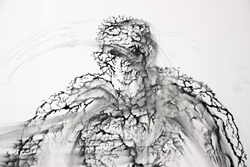 The dancer Ingrid André and charcoal drawing, yet untouched. 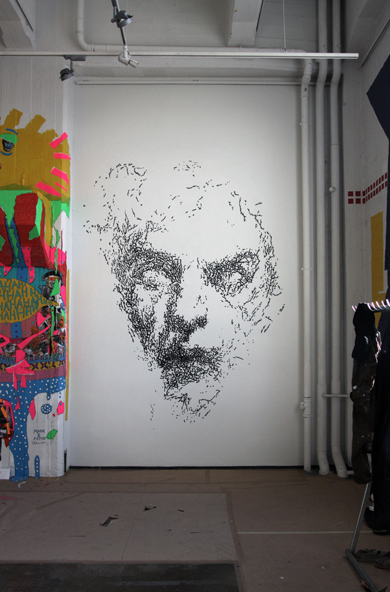 Mural at MUU Kaapeli, Cable Factory, Helsinki 6.-30.3.2014. 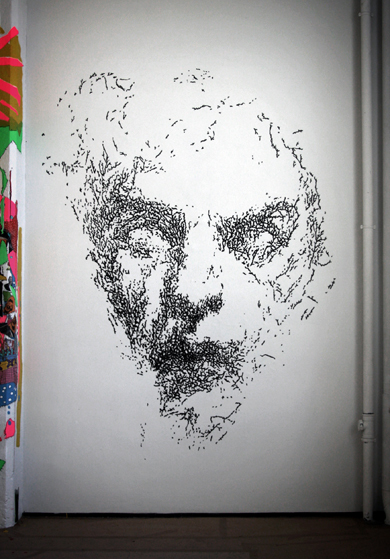 Vappu Rossi: Twig Face, 2014. Latex paint on the wall. 400 x 260 cm. Tiedekeskus Heurekan Heureka tulee hulluksi -näyttelyn visuaalisen ilmeen selkärangan muodostavat kymmenet kuvataiteilija Vappu Rossin uniikit seinämaalaukset, jotka hän on toteuttanut tilaustyönä suoraan näyttelyn rakenteisiin. Heureka tulee hulluksi, 12.10.2013–21.9.2014. The visual foundation of the Finnish Science Centre Heureka exhibition Heureka Goes Crazy is made up of unique wall paintings by artist Vappu Rossi, who has created the works directly onto the structures. 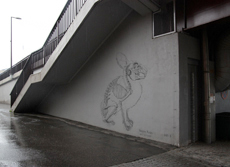 Heureka Goes Crazy, 12.10.2013–21.9.2014. Heurekan jälkeen näyttely nähdään Lissabonin Pavillion of Knowledgessa, Pariisin Universciencessa ja Haagin Museonissa. After Heureka, the exhibition will take place at the Pavillion of Knowledge Lissabon, Universcience Paris and Museon Haag. 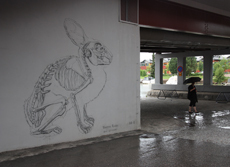 Making of wall drawing HAWK MOTH, Vappu Rossi 2012. 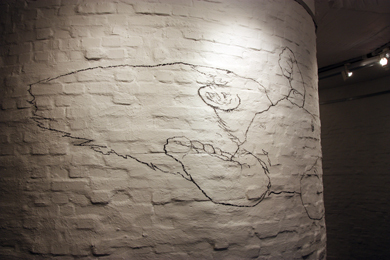 Making of wall drawing THE KISS, Vappu Rossi 2012. Rajantaju, Taidekeskus Purnu, Orivesi 10.6.–12.8.2012. 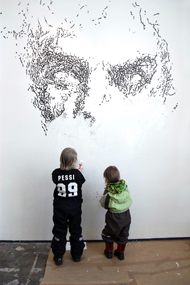 Rajantaju, Purnu Art Center, Orivesi 10.6.–12.6.2012. 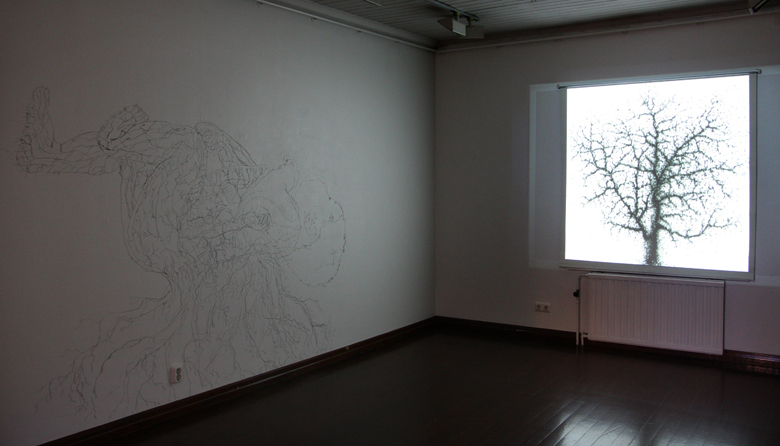 Making of wall drawing NEWBORN (BREATHING ROOTS), Vappu Rossi 2012. 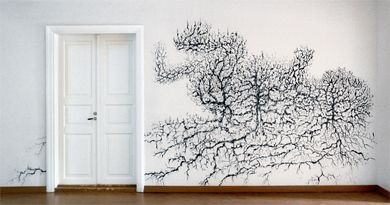 Newborn (Breathing Roots), 2011. 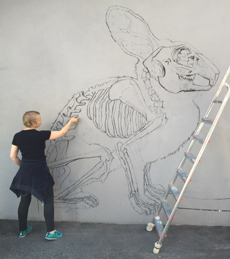 Charcoal on wall. Haihara 11 - METSÄSTÄ, Haiharan taidekeskus / Invitation exhibition Haihara 11 - FOREST, Haihara Art Center, Tampere 6.–28.8.2011. Portsarit (Skylla ja Kharybdis) Portierer (Skylla och Kharybdis) / Doormen (Skylla and Charybdis), charcoal on wall, 2007. Piirustusluokka – Tyhjä on täysi, Kuvataideakatemia 160 v. Taidehalli 11.12.2007–13.1.2008. 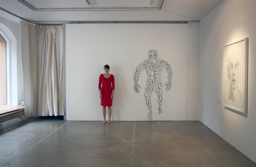 Doormen (Skylla and Charybdis), 2007. 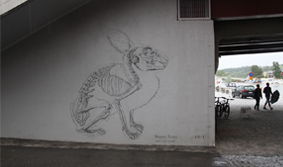 Charcoal on wall, anamorphic drawing on the stairways of Kunsthalle, Helsinki. 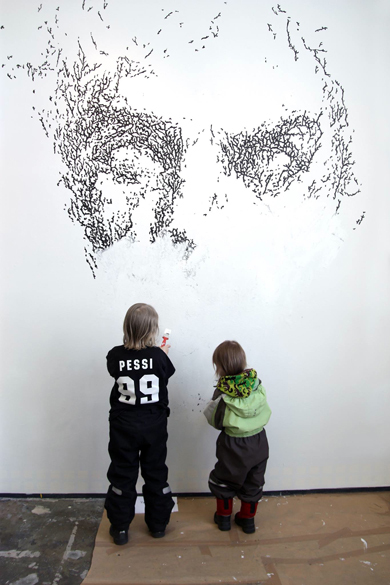 Drawing Class – Empty is full, Finnish Academy of Fine Arts 160 years, Kunsthalle, Helsinki 11.12.2007–13.1.2008. From the "right" point of view. Portsarit (Skylla ja Kharybdis) Portierer (Skylla och Kharybdis) / Doormen (Skylla and Charybdis), 2007. Kuva suoraan edestä. 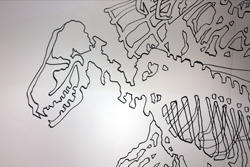 Image in reality, from the front. 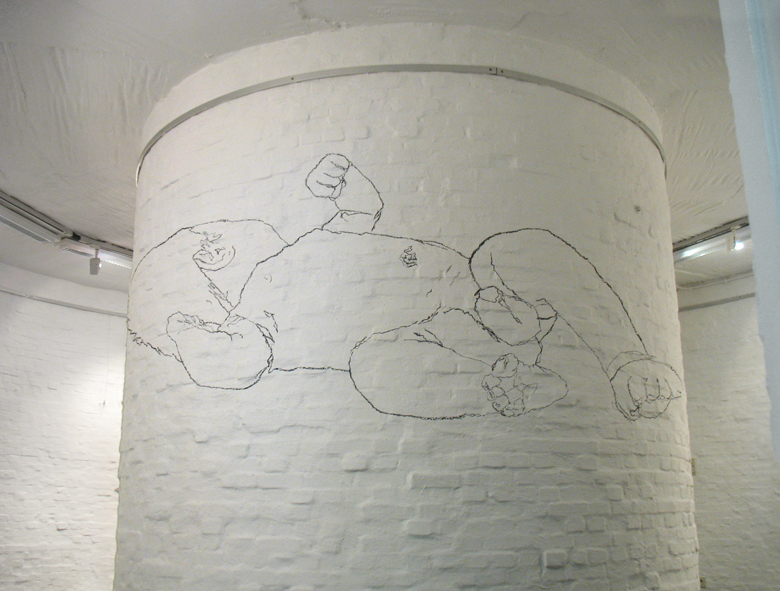 Below: Newborn (l'enfant de Kasterlee), 2011. Ephemera, Galleria Harmonia 13.1.-5.2.2011, Jyväskylä. 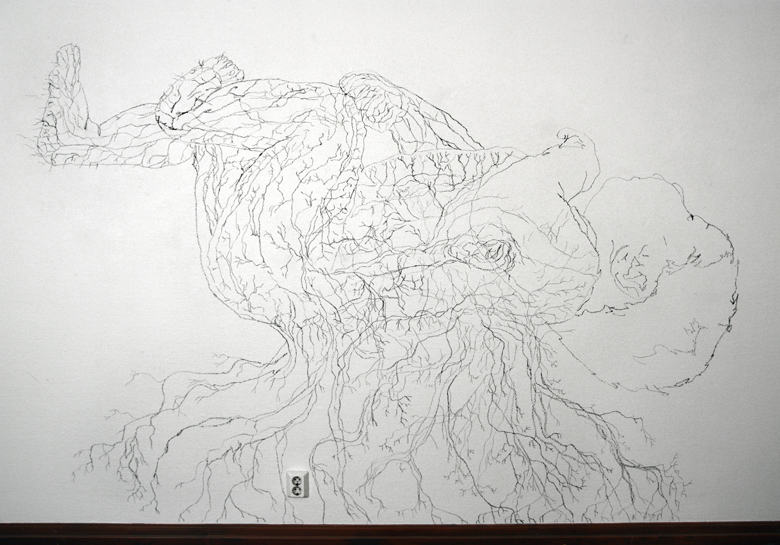 Charcoal on wall, 190 x 280 cm. 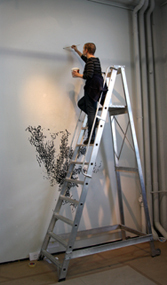 Below: Newborn (l'enfant de Kasterlee), 2011; Elämän puu / Livets träd / Tree of Life, media art animation, 2009. Below: Newborn (around the core), 2010. Frans Masereel International Printmaking Centrum, Kasterlee, Belgium. 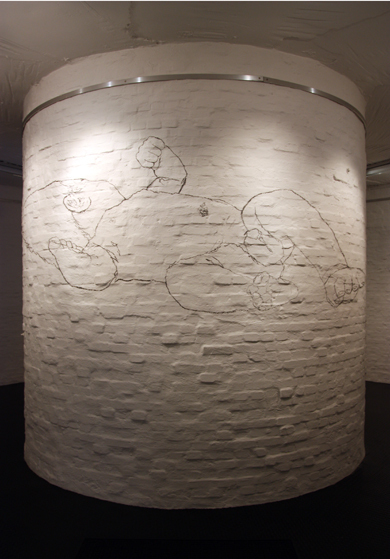 Anamorphic drawing, charcoal on wall (the central pilar of FMC), width c. 3,5 m.
Reunalla - Aan de rand - On the Edge, Frans Masereel International Printmaking Centrum, Kasterlee, Belgium, 1.10–30.11.2010. 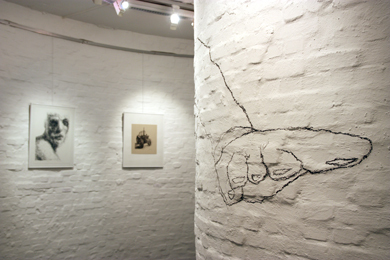 Exhibition of finnish Pro Lithography. The little toes and the head of Newborn in reality. Rossi's lithographies in the backround.